Katie Busse of Wauseon won two national titles and took second and third in two other events at the World Karate Commission National Tournament in Detroit June 8-9. The performance qualified her for Team USA where she will compete at the World Championships in Dublin, Ireland this fall. 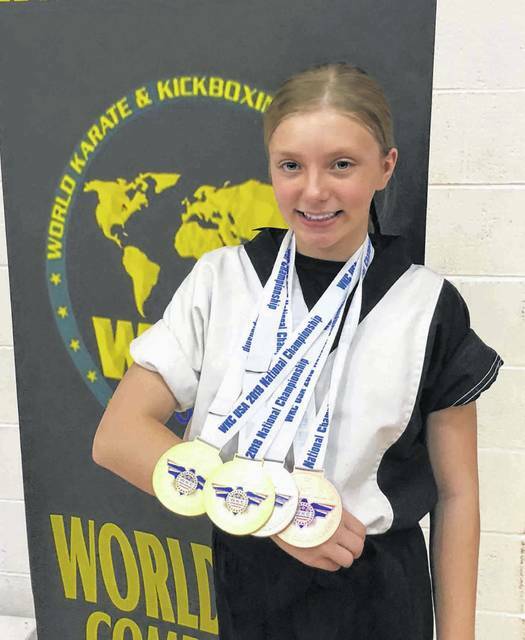 Katie Busse, 11, of Wauseon recently competed in the World Karate Commission (WKC) National Tournament in Detroit where she won two national titles. Busse won a Gold Medal in Free Form, a Gold Medal in Extreme Forms, a Silver Medal in Open/Musical Weapons, and a Bronze Medal in Creative Weapons. Free Forms and Extreme Forms are both divisions known as “empty hand” in which she performs katas without a weapon. Open/Musical Weapons and Creative Weapons are both forms in which a weapon is incorporated into the kata. Katie performs using a bo staff as her weapon. Busse’s performances at nationals earned her a coveted spot on Team USA. This October 27 – November 4, she will travel to Dublin, Ireland with Team USA to represent the United States at the WKC World Championships. She will be competing in the same four events she competed in at nationals. Katie is the daughter of Jerry and Jennifer Busse of Wauseon. She has two younger brothers and a younger sister who are also in martial arts. They all take classes at Daniel Turner’s Karate America in Toledo. Katie has been in martial arts since she was six, and earned her black belt in December.